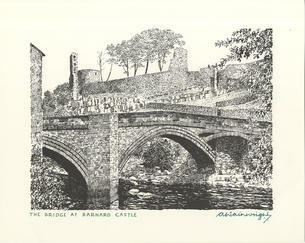 This is a Hand Signed Black and White 10" x 8" print of the Bridge at Barnard Castle by the late English Fell Walker, guidebook author and illustrator. Alfred Wainwright ("A.W.") MBE (17 January 1907 - 20 January 1991) was a British fellwalker, guidebook author and illustrator. His seven-volume Pictorial Guide to the Lakeland Fells, published between 1955 and 1966 and consisting entirely of reproductions of his manuscript, has become the standard reference work to 214 of the fells of the English Lake District. Among his 40-odd other books is the first guide to the Coast to Coast Walk, a 192-mile long-distance footpath devised by Wainwright which remains popular today.